Clearly a controversial term to define, yet a consensus appears to have been reached between many academics and clinicians as to what the term ‘physical activity’ should represent. That said, we must continue to express the importance of the dose-response concept, which advises that ‘people with lower baseline fitness can achieve greater health benefits with a given increase in physical activity’ (2) when providing guidelines and advice on physical activity participation, especially with those who are currently inactive. Present guidelines for physical activity, however prevalent, are far too vague and are worryingly out of reach of the general public. This has recently been modified, with guidelines focusing more heavily on participation at a minimal level at first, prior to the application of progressive overload up to the stage where children and the previously inactive wider population meet and ultimately exceed these guidelines. 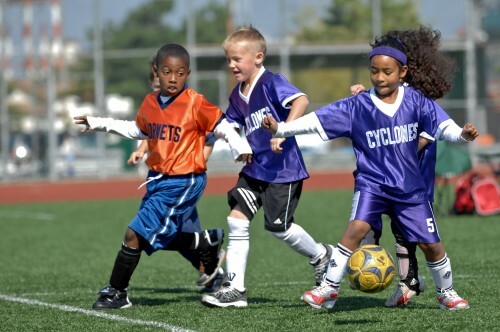 Current guidelines now propose that children partake in 60 minutes (minimum) of a mixture of moderate and vigorous physical activity daily with 2-3 days focused on both muscle and bone strengthening activity. (5) Guidelines repeatedly indicate that this activity can be accomplished through an accumulation of several 10 minute periods of activity across the day. Recommendations appear to address the comments of Smith and Biddle through the recognition that some amount of activity can provide the ‘physical, psychological, and social benefits to youth’ to a greater degree than no activity at all. The first obstacle that we must overcome when seeking to solve the issue of inactivity and sedentary behaviour among children is surely to identify what activity (or lack of) would be classified as sedentary. Sedentary behaviour can quite simply refer to any activity that does not require greater energy expenditure than that of rest. Another considerable obstacle that faces health clinicians and practitioners, along with fitness professionals is knowing how much time spent being sedentary is too much. The striking lack of evidence and therefore provision for reducing physical inactivity and sedentary behaviour in children is summarised by the British Heart Foundation: ‘it is not yet possible to provide a quantitative recommendation to indicate a duration of sedentary time above which health may be at risk’. This is of course a serious worry and can result in health professionals being left to base recommendations solely upon their knowledge of other areas and suggesting guidelines without factual evidence. However, based on a study of 232 subjects, Trembley et al. proposed that watching in excess of 2 hours of television daily was associated with decreased fitness levels, unfavoured body composition, and decreased academic achievement. These were just three of the negative stigmas associated with the findings. These three stigmas also hold reference to the each of the ‘physical, social and psychological’ risks addressed by Smith and Biddle. When comparing the findings to a similar study, there are certainly calls for concern. (6) The researchers concluded girls spending an average 6.7 hours of their free time sedentary at the weekend as opposed to just 47 minutes of active play. Such results have serious implications for children’s health. We must do more than simply address the figures however. Provisions need to be in place across all areas of an individual’s life to reduce physical inactivity. This could begin by simply reducing the prevalence of lifts and escalators in unnecessary locations such as airports which currently discourages movement. ‘Physical inactivity has been identified as the fourth leading risk factor for global mortality (6% of deaths globally)’. (7) This statistic should serve to frighten in many ways. That same statistic should also serve as a primary figure leading the effort to eliminate such a needless cause of mortality across the population, with many individuals suffering later in life from a lack of participation in physical activity at a young age. The concept of tracking (‘the maintenance of an individual’s relative position within a group over time’) (8) articulates that by targeting the population from a young age, we can in fact, ensure that people take heed of the slogans promoted by the Department for health, to ‘Start Active’ and ‘Stay Active’. The World Health Organisation also indicates that 6 out of 10 deaths are attributable to non-communicable diseases. These diseases can be cured. To do so however, we need to ensure that people become involved from an early age and then stay involved. The risks of physical inactivity exceed those of solely physical risk. Physical activity enhances cognitive function and social development among individuals of all ages, but especially of those in their primitive and younger years. Taylor et al. summarise the many benefits of physical activity brings quite excellently: ‘physical activity and exercise might provide a beneficial advance for alcoholism and substance abuse programs: improve self-image, social skills, and cognitive functioning; reduce the symptoms of anxiety’. (9) Once more, we see a focus on the benefits of physical activity physically, socially and psychologically. The dangers of an inactive lifestyle in which vast majorities of the population and increasing numbers of children below the age of 18 are experiencing, alongside a failure to meet the recommended guidelines for physical activity are evident. It is also apparent that researches are taking a growing interest in the concept of tracking and the effect that this notion has on participation levels in later life. Guidelines remain all too vague even now and it is too easy to critique the lack of frequency in which new, more advanced guidelines, are introduced. The extent of inactivity and sedentary behaviour among UK children is rising, with free time too infrequently occupied by physical activity. The risks to children’s physical, psychological and social health and achievement is clearly all too great. If this ‘pandemic’ of global inactivity is to be solved, the general public need to be made aware of the significant benefits that can be realised through any type of participation. The emphasis needs to be on supporting the inactive to ensure they become involved in any activity that they enjoy, rather than setting only ideal guidelines that are simply discouraging for those currently failing to participate in any notable level of physical activity. (1) Bouchard, C., Blair, S.N. & Haskell, W..Physical Activity and Health (2nd Ed). (Champaign, Illinois: Human Kinetics, 2012), p.12. (2) Rahl, R.L. Physical Activity and Health Guidelines: Recommendations for Various Ages, Fitness Levels, and Conditions from 57 Authoritative Sources. (Champaign, Illinois: Human Kinetics, 2010), p.7. (3) Smith, A. & Biddle, S. Youth Physical Activity and Sedentary Behavior: Challenges and Solutions. (Champaign, Illinois: Human Kinetics, 2008), p.xv. (4) American College of Sports Medicine, ACSM’s Guidelines for Exercise Testing and Prescription, (Philadelphia, PA: Lippincott Williams & Wilkins, 1975). (6) Biddle, S.J., Gorely, T., Marshal, S.J. & Cameron, N., ‘The prevalence of sedentary behavior and physical activity in leisure time: A study of Scottish adolescents using ecological momentary assessment’, Prev Med, vol. 48, no. 2, (2009), pp. 151-155. (9) Taylor, C.B., Sallis, J.F. & Needle, R. ‘The relation of physical activity and exercise to mental health’, Public Health Reports, vol. 100, no. 2, (1985) pp. 195-202. -British Heart Foundation, ‘Sedentary Behaviour’, (2015). -Department of Health. (2011). Start Active, Stay Active: A report on physical activity for health from the four home countries’ Chief Medical Officers. -Tremblay, M.S., LeBlanc, A.G., Kho, M.E., Saunders, T.J., Larouche, R., Colley RC, et al., ‘Systematic review of sedentary behaviour and health indicators in school-aged children and youth’, International Journal of Behavioural Nutrition and Physical Activity, vol. 8, no.98, (2011).